When you think of buying a crochet book, most people are looking for a variety of patterns. Design Your Own Crochet Projects by Sara Delaney has a different approach. While still providing a variety of crochet patterns, it gives you the details on how each pattern is designed and sized. I wish there was a book like this years ago when I started designing my own crochet patterns. It gives you the insight into how the author develops her patterns so that you can extrapolate what you want to make your own. Math!!! I’ll admit, I’m a math geek so I love math, but if you don’t it may take you by surprise how much math is involved in designing and sizing patterns. A quick thumb through the book and you’ll notice the lovely photos of the projects along with the pages full of calculations. While it may be easy to follow for some, it may look like a foreign language to others. You can get your own first impression by using the Look Inside feature on Amazon. You’ll be able to see the first few pages, and even get to see a few of the full crochet patterns and how they are formatted. Like many books, it starts with an introduction. It discusses different fiber types and everything you would need to know about swatching. Although most folks would tend to skip over this section, I would recommend reading through the swatching section since gauge is super important when crocheting wearable items. Swatching is also a big part of design in each of the patterns. If you don’t swatch you won’t get very far in the book. After the intro, there are 7 sections: scarves, cowls, hats, fingerless mitts, mittens, gloves, and socks. Each section has 2 patterns, with the exception of the hats and socks, which have 4 patterns. Each pattern is written like a standard crochet pattern, so you can crochet the item just like you would with any other pattern. What makes this book different, and more geared towards teaching you how to design your own pattern, is the section before the pattern that walks you through how the sizing was calculated using the swatch size. Taking the time to actually read through the calculations sections will teach you the sizing aspect of design. It will give you the skill to interchange weights of yarn and adjust the pattern to fit your own gauge. If you are ambitious you can then use the calculations to form your own pattern. If performing all the math seems too daunting, check out the online crochet calculator page that goes along with the book. 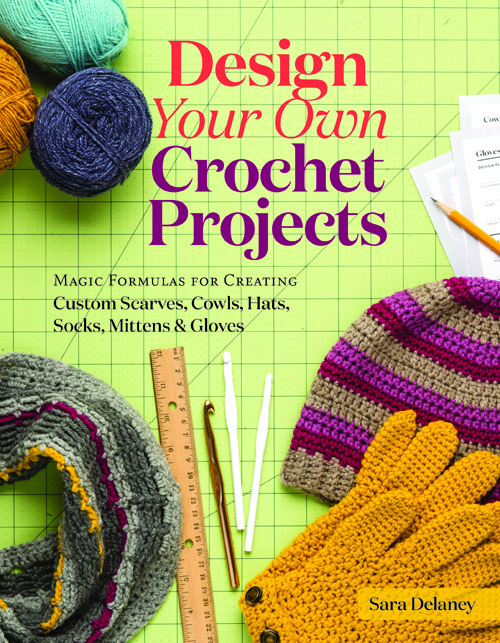 While the book is great at teaching the math of crochet and giving demonstrations on how to size items, it doesn’t teach the visual part of design, how to create your own stitch patterns, or your own unique look to a pattern. To be fair, who can really teach that anyway? You are your own measure of creativity and only experience in crocheting can help you with that. The book is filled with examples for crocheting accessories, which is a great first step in the crochet design world. Larger items, such as sweaters, are beyond the scope of this book. It also doesn’t include blankets, home decor, or toy patterns. Design Your Own Crochet Projects is great for learning to size your own crochet accessories. But if you aren’t interested in learning the ins and outs of sizing, you can still crochet the patterns that are included in the book. It won’t tell you everything you need to know about pattern designing, but it is a very good start. If you’re new to pattern designing and are willing to take the time to learn and do a bit of math, then this book will be an excellent teacher for you! Leave a comment below stating which section of the book you are most interested in learning about: scarves, cowls, hats, fingerless mitts, mittens, gloves, socks, or other. Also free free to look inside the book for yourself using the Amazon Look Inside feature where you can view full patterns and the beginning parts of the book. Please only one comment per person, as multiple comments will be deleted. A winner will be randomly drawn and announced on November 16, 2017. Shipping from Storey Publishing is limited to the U.S. and Canada. Update: This giveaway is now closed. Check out the Giveaway Winner page. This entry was posted on Thursday, November 2nd, 2017 at 12:00 AM by Rachel Choi	and is filed under Fun Ramblings, News. You can follow any responses to this entry through the RSS 2.0 feed. Both comments and pings are currently closed. Hat, scarves and cowls, Would love to know how to design my own. I’m too timid to just try to design something without some guidance and this book is ideal.Sara’s book looks like it is easy to follow and written in plain english. Congratulations Sara on a successful book. I am interested in learning how to crochet your fingerless mittens. I am most interested in the hats and scarves sections. I would be interested in the hats and scarves I volunteer in an inner city school and these are very much needed. After those mittens would be next. I’ve always wanted to try socks. One thing I have yet to tackle. I’m really interested in the whole book but if I had to pick a section I might say I’m most interested in the mittens and gloves. I would love to try socks and am just generally interested in ways to shape with crochet to make clothes that are more form fitting. I can’t think of just one section of the book that I would be most interested in! Though hats are my favorite, I’m really interested in learning how to crochet gloves. I have poor circulation in my hands so tons of gloves are a must. I’m most interested, however, in not just one section, but the calculation sections overall. I would love to be able to better cater to people’s particular sizing needs. I am interested in hats. I would like to make them for my family but it seems they’re always too tight or too loose. I’d love to be able to make them perfect every time. Thank you for the opportunity to win! I am interested in both cowls and hats. I like to make my own winter accessories for myself and family and learned how to crochet earlier this year. Thanks! All. I’m interested in it all. I rarely follow a pattern as written and often I’ll pick up yarn and hook and just make something but, same as in the author’s foreword, I rarely write it down. Unlike a lot of the books I have, I think this one will up my game. I would head to the socks section first! LOL! Love the section of fingerless gloves. I am interested in all projects as I love to make hats and scarves for donating to charities and also for friends –I would LOVE to be a winner. Looks like something I want. Sometimes you want to tweak a pattern and I just get too scared to do it on my own. Looks like this books would be able to show me how to make variations without messing up the whole project. The hat section along with the calculators, appears really useful to be able to customize the hats I make! What an awesome introductory book into becoming a crochet designer. I would someday love to learn how to size more complicated things like sweaters, but if I won this book, I would first go straight to the mittens section. Great review! I am interested in learning to adapt patterns to different sizes. Definely hats and sizing, my daughter likes to suggest I have a big head. Seriously thick hair. Thanks for the opportunity! I am interested in the whole book. Have been taking classes to learn more about designing and how to write the pattern out. So love the whole book. Socks to warm my cold, cold feet. That is what I am most interested in. I am interested in learning how to crochet gloves. I believe the whole book would be of interest to me. Wow. This would be so helpful …especially now that I’m a year into learning how to crochet. Instead of spending all this time searching for the exact picture and pattern, I could learn how to design my own. I would be thrilled to own this book. I would love the chance to read it cover to cover, but I think I’d have to dive into the socks and gloves sections first! I have always wanted to try my hand at making those! All sections would save me time and ripping while I try to determine how many stitches to use for different needle sizes. The On Line Crochet Calculator Page looks like info I could use. I crochet mostly for charity so I know that what ever I make will fit someone. However, crocheting for family and friends has to be more precise. So the Calculator would come in handy along with all the other helpful hints and photos in the book. Thanks for the new GiveAway! I’m interested in the whole book, but I’ve been wanting to tackle socks for quite some time, so this might be where I’d spend most of my time.